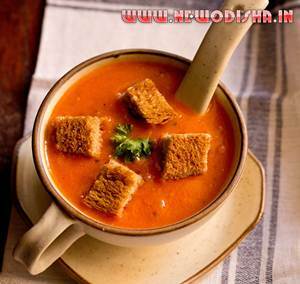 Tomato Soup is one of a healthy soup and also tasty. If you want to make Tomato soup at your home then see the below step by step guide to know How to Make Tomato Soup at Home. 1 tbsp cream – you can consider adding 2 tbsp cream or dot with cream when serving the soup. remove the stems if there are any. in a saucepan or pot take enough water so that the tomatoes get immersed completely. add 1 tsp salt to the water and bring the water to a rolling boil. add the tomatoes and switch off the fire. close the saucepan or pot with the lid. let the tomatoes be immersed in the hot water for 20-30 minutes. in the meantime, finely chop the onion and garlic. place the bread in the pan and on a low flame toast the bread till its browned and crisp from both sides. if using the oven, place the bread in the oven at 200 degrees C and toast the bread till its browned and crisp. drain the tomatoes and let them become warm or cool down. then directly chop the tomatoes above the blender jar so that the juices drop directly inside the blender jar. if you cannot do this, then chop the tomatoes on a chopping board and add everything to the blender including the juices. add the garlic and saute for about 10-12 seconds on a low flame. add the chopped onion and saute till the onions become translucent. on a low to medium flame, let the soup come to a gentle boil. stir the corn starch paste (since the corn starch settles down) that we made earlier and add it to the soup. stir well and simmer for 3-4 minutes till the soup thickens on a low flame. then add the cream and simmer for a minute. garnish tomato soup with parsley or coriander leaves. Give Responses for "How to Make Tomato Soup at Home"